We will make everything from scratch in this class. First we will use boiling water and flour to make fresh dough. This recipe may seem simple, but this basic dough can be combined with different ingredients in various ways to create a remarkable variety of dumplings and other dishes. This humble dough is the base for making many of the dumplings that you will find in Chinese-style dumpling restaurants. Getting your dough right is the key that unlocks a whole world of northern Asian cuisine. 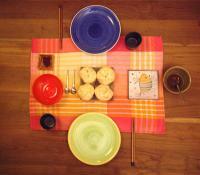 We will practice how to roll the dough, and making it into thin dumpling wrappers. Then we will practice the delicate art of filling the wrappers with just the right amount of shiitake mushroom, pumpkin and cilantro (coriander leaves) and sealing them up. After that, it takes just minutes to cook steamed dumplings in a traditional bamboo steamer. And we will also use a pan to fry up some delicious pot stickers (guo tie). We will make one of the most commonly seen street foods, pockets. We will fill the pocket with pumpkin, corriander and mushrooms. The pocket is similar to a smaller vision of Italian Cazona pizza. You can try filling them with whatever your creativity can dream up. And we are going to use the same dough to make the most popular Taiwanese and Chinese snack, green onion pancake. It looks simple, but there's an art to giving the dough the correct light and airy texture by a combination of rolling and folding – it's a little like making croissant dough. Green onion pancake is a quick, filling snack that you can easily eat with your fingers, so will often see it sold at street stands and in every night market in Taiwan - both the thick style that we learn here, and the slightly different thin style. It's also a very popular order in northern Chinese dumpling restaurants. For a sweet conclusion to the class, we will use black sugar and sesame to make a really tasty and healthy dessert with the same dough: black sugar and sesame pancake. This is also something you simply have to try when you visit a dumpling restaurant. Dumplings are a common Asian dish that's equally popular with people from both East and West. There are many different kinds of dumpling. 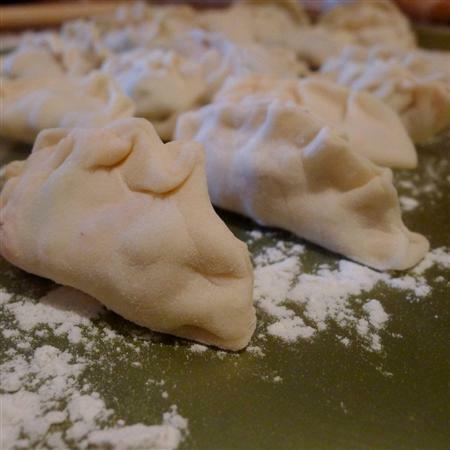 In this class we will make dumplings using wheat flour of the same kind used in Western baking. We will also make another popular dish that's based on similar basic ingredients, Green Onion Pancake. Both of these are originally Northern Chinese dishes, which are also made by many people in Taiwan. We keep things simple by using a basic vegetarian filling, but once you learn how to make and cook dumplings, it's very easy for you to modify the filling to use your own favorite ingredients and flavors. Other common dumpling fillings include pork, shrimp, mushrooms, glass noodles, and for sweet dumplings, sweet red bean and black sesame. Asian people use bamboo steamers to cook dumplings, and Western people use an oven to cook bread. 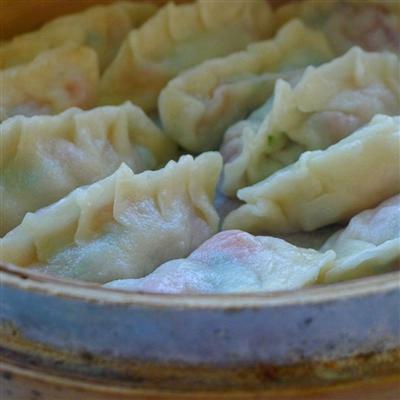 But there's actually a lot of similarity between the dough used for both of these popular foods, so these kinds of dumplings are very easy for Western people to learn. While it's common to cook dumplings in a bamboo steamer, pan frying them in a frying pan or wok is also a very fast way of making them. This way it's possible to serve more than 10 to 20 people at a time. Cost: Our price for this standard one day (about 4 hours) class is NT$4,000 for one student (about HK$1100, US$130 or 95 Euros), NT$7,000 for two students (about HK$1900), NT$10,000 for three students, and NT$12,000 for four students. Sorry, but we do not offer discounts for these classes. Note: These details apply to the standard class which you can see on this page. Some custom designed classes or classes with more expensive ingredients may cost more or last longer.